​​​​​Do you have packages ? I usually shoot 8 hours of continuous coverage, and include a curated selection of approximately 700 images. The images will be high resolution files, with print rights. You can print and share all you like.The copyright remains with the photographer, which is an industry standard. I include a beautiful fine-art photography book that captures the spirit of your day, and tells the story of your Wedding in an artistic editorial style. Additional books can be ordered as required. ​You sort of create your own package. ​ Not really. I have become a local girl lately. I love shooting Weddings on Vancouver Island and surrounding areas. I have shot Weddings in seven countries, and I am happiest closer to home these days. Vancouver is fine though. ​I am mostly a photo-journalistic style Wedding photographer, but with an editorial bent. ​ I am at my best when deeply immersed in capturing your day as it naturally unfolds. Done skillfully, this can be story telling at it's finest. The smiles will all feel real. Everything feels authentic. I do spend some time taking family photos..they are very important, and become even more so as the years move on. Because I shot fashion and advertising in Toronto for many years, I think this also informs my work. It's natural for me to quickly find the best angles, to seek the most flattering light. That would be the editorial bent..the stuff that looks like you might see it in a fashion magazine. I shoot like this naturally..I always seek to make people look great. Because I have directed T.V. commercials, my work has a natural sense of movement. So I am very comfortable with transitioning between the stillness of a portrait, and shooting completely unscripted moments. I always work to strike a balance, candid moments, beautiful portraits, and lovely details. Together, these images tell the story of your Wedding day, in an artistic and authentic way. The goal is always to create a beautiful collection of photographs that beautifully represent your day. We want to hire you, what can we expect to spend ? Thank-you. I would be honoured to collaborate with you, and be part of your carefully curated team of event specialists. An investment of $3000.00 - $5600.00 is pretty standard. It really depends on how much time you need, and how many additional fine-art books you require. Everyone has different requirements. Call me directly, and we can talk about your Wedding day in detail. I welcome all inquiries. If you are getting married in the "shoulder season" ask me about my special rates. 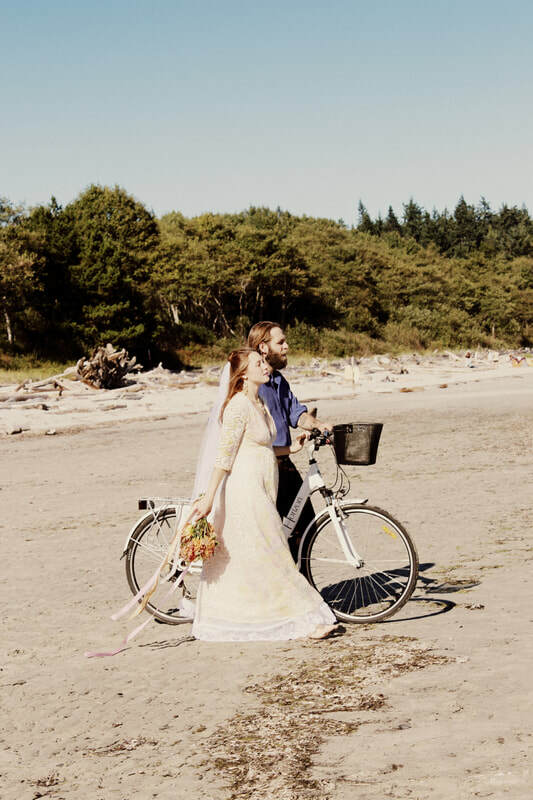 I also have special rates for Vancouver Island and Hornby Island elopement style weddings. That's easy! Either phone me up directly, or send me an email. This deposit holds your day, and goes toward the final fee. GINA-RAE HORVATH photographing Weddings on Vancouver Island, and the Gulf Islands. Capturing the beautiful memories of your Wedding day forever. Vancouver Island wedding photographer , Vancouver Island portrait photographer, Vancouver Island Editorial photographer.